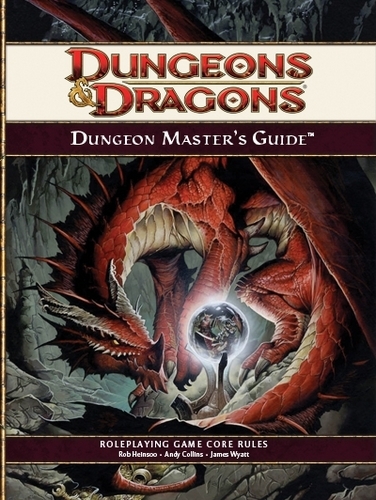 For use with 4E, Gives you desciption of key terms in Dungeons and Dragons. Note: The file at the bottom has this in word format. Actions: Each round you may take a standard, move, and minor action. Shift a 5' step is a move action. To draw a weapon is a minor action. Some classes and races have lots of powers that are minor actions, some almost none. You may trade actions down (standard for a move or minor; move for a minor). You may get up to one immediate action per round, such as an opportunity attack, if the appropriate conditions occur. Action Points: Using an action point give you another action (standard, move, or minor) on your turn. You can use one per encounter. Start the day with one; gain one more every other encounter. Taking a full rest resets your AP to 1. Attacks: Roll 1d20 plus modifier against the appropriate Defense: AC, Fortitude, Reflex, or Will. Ranged attacks between normal and maximum range suffer -2 to hit. Bloodied: You are Bloodied at half your hit point total (round up). The Bloodied condition may allow special actions. Bull Rush: To initiate a bull rush, you need to make a Strength Check vs. the target's Fortitude Defense. This does not provoke an Opportunity Attack (formerly AoO). If you succeed, you may push the target 1 space. The margin of success doesn't matter, and 1 space is the maximum that a target can be moved with Bull Rush (without taking special abilities). Charging: Charging in combat is a standard action that allow you to move up to your speed and attack. It grants a +1 to hit, and no penalty to AC. Combat Advantage: You get a +2 to hit the target. Flanking a target allows you to have Combat Advantage against a target, as do most physical afflictions (such as being immobilized or prone). Being on fire, however, does not grant foes combat advantage. Cover: If the enemy has cover, take a -2 penalty to attack rolls. Friendly creatures cannot provide the enemy cover, but other enemy creatures can. Total cover, such as an arrow slit, is a -5 penalty. Critical Hits: Every natural 20 on a d20 attack roll is a critical hit. Confirmation roll no longer needed. All critical hits are confirmed by default. Critical hits apply to spells and wizard/cleric powers too, so long as there is an attack roll. Damage from critical hits is maximized. For example if your attack/power/spell would deal 2d6+3 on a normal hit, a critical hit will deal (2*6)+3=15 damage. Weapons, Magic Items or Powers could alter your critical hit range or damage. 1-9: You get worse. If you get this result 3 times before being stabilized, you die. As a Standard Action, an ally can make a Heal check to stabilize you. If they make DC 15, you are stabilized. If they make DC 20, you haven't used your Second Wind yet this encounter, and you have a Healing Surge remaining, your Second Wind is triggered. If anything heals you, you return to 0 HP before the healing is applied. Full Defense: You don't take any actions, but you get a +2 to all defense scores until the start of your next turn. Grapple: You can attempt a grapple check with anything that is within 1 size category of you. To initiate, you make a Strength Check vs. Reflex Defense. This also doesn't provoke an Opportunity Attack. If you fail, nothing happens. If you succeed, you cause your target to be "Immobilized" for one round. The target can escape his immobilized condition using an Acrobatics or Athletics check. You may move the target 1 square by succeeding on an additional grapple check in the following round. Healing Surge & Second Wind: You have a number of healing surges, each of which may be used out of combat to restore a number of hit points. During combat, you may use Second Wind once per encounter as a standard action to use one of your healing surges to heal – and you receive a +2 bonus to all defenses until your next turn. Some powers are powered by healing surges. Immobilized: You cannot move on your own: your Speed is 0. Otherwise, you can act normally. Effects that push, pull, or otherwise transport you still work normally. Foes around an immobilized target get combat advantage against him. Marked: You can only be marked by 1 creature at a time. If another creature marks you, you lose the old mark and gain the new one. You are at -2 on all attacks that do not include the creature that marked you as a target. You may suffer other penalties for attacking a creature other than the one that marked you, if that creature has such an ability. Movement: Diagonal movement counts as 1 square. Difficult terrain doubles movement cost. Moving away from an adjacent opponent draws an opportunity attack, unless you Shift. Ongoing Damage: At the start of each of your turns, you take a given amount of a given type of damage. Example: “ongoing 5 acid damage” deals you 5 acid damage at the start of each of your turns. If the duration of the effect is 'save ends', remember that saving throws are made at the end of your turn. Opportunity Attacks: You can make up to one of these per each opponents turn. Moving away or by an opponent, or using a ranged attack adjacent triggers them. A fighter power allows the fighter to make an opportunity attack against an enemy that shifts (takes a 5' step). Reach: Creatures with reach only threaten the squares immediately around them, unless they have a special ability. Their full reach is only active on their turn, and cannot be used for opportunity attacks. Resting: A short rest is 5 minutes, and allows you to use healing surges. An extended rest is 6 hours, and at the end you are fully healed, all healing surges and daily powers restore, action points set to 1. Running: Add 2 to your speed as a move action when running. Running provides opponents Combat Advantage until the beginning of your next turn. Shift: You may move one square as a move action without drawing an opportunity attack. Slowed: The movement of a slowed character drops to 2, and this applies to all movement types except for teleportation. Stunned: If you are stunned, you can't take any actions for a round, but you no longer drop all of your held items. Sustain minor: use a minor action to keep doing it. Blast (x): This effect is a line of squares (x) squares long. Blinded: You cannot make Ranged Attacks or Opportunity Attacks. All enemies have Concealment 11 against you (when you hit them with a Melee or Ranged attack, roll a d20: On a result of 11 or greater, you hit. Otherwise, you miss.) All enemies have Combat Advantage against you. Burst (x): This effect is an area including all squares (x) distance from an intersection. Close: A Close attack initiates in a square adjacent to the attacker. Combat Advantage: You get a +2 to hit the target. Flanking a target allows you to have Combat Advantage against a target, as do most physical afflictions (such as being immobilized or prone, or running). Being on fire, however, does not grant foes combat advantage. Dazed: You may take only 1 action per round. All enemies gain Combat Advantage against you. You cannot flank enemies or help an ally gain flanking. You cannot make Opportunity Attacks or use immediate actions. Invisible: No one has Line of Sight to you. No one can target you with a Ranged Attack. You have Concealment 11 against attackers (when they hit you with a Melee or Ranged attack, they roll a d20: On a result of 11 or greater, they hit. Otherwise, they miss.) You have Combat Advantage against enemies you attack. Enemies cannot make Opportunity Attacks against you. Example: “ongoing 5 acid damage” deals you 5 acid damage at the start of each of your turns. If the duration of the effect is 'save ends', remember that saving throws are made at the end of your turn. Prone: You are lying on the ground. You may crawl at move half speed, and you opponents have Combat Advantage. Any attacks from the prone are at -2. You may stand up from prone as a move action, but opponents who threaten you get an opportunity attack. Recharge: A some encounter powers have a chance to recharge. At the start of the creature’s turn, roll d6. If the recharge number shows on the die, the power has recharged and may be used on that turn. Example: “Recharge 5 6” means the power recharges on a d6 roll of 5 or 6. Skill Checks: Creatures make skill checks wit a d20 roll + appropriate skill modifier. For passive detection, compare the sneaking creature’s Stealth check against the watching creature’s Passive Perception (10+Perception). Slowed: Your Speed is 2, unless it would otherwise be 1 or 0, in which case it is unchanged. If you have multiple speeds (EG Fly, Climb), they are all reduced to 2 as above. Stunned: All enemies gain Combat Advantage against you. You cannot flank enemies or help an ally gain flanking. You cannot make Opportunity Attacks or use immediate actions. On your turn, you take no actions. Remember that rolling a saving throw is not an action. Unconscious: All Melee Attacks against you are automatic critical hits, maximizing all dice. All other attacks against you gain a +4 bonus; all enemies have Combat Advantage against you, making the bonus to Non-Melee Attacks +6. You cannot flank enemies or help an ally gain flanking. You cannot make Opportunity Attacks or use immediate actions. On your turn you take no actions, but can still make saving throws.